Radio Sharri is a new online Albanian radio station. Sharri is a one of the popular online radio station on Albania. Radio Sharri has been started to broadcast LIVE, but it also a part of test transmission. Radio Sharri broadcast 24hours Latest Albanian classic, hip-hop, oldies, local etc. music from there own radio station. 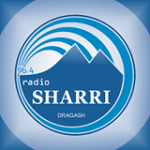 SHARRI Radio is the first broadcaster in Kosovo, established in Dragash, just 10 days after the war ended on 25 June 1999. Currently, our waves lie in the territorial space, which includes about 500 thousand inhabitants. Exactly, our waves covering Northeast southwestern Kosovo and Albania, while, through the internet, our waves around the globe cover with clean signal, according to the latest technology. • According to the most recent research that has the OSCE regarding media market and listenership of radio stations in Kosovo, showed that Radio SHARRI, although highly competitive in the region of Prizren, preferably from about 85% of respondents, age of whom turns out to be different, depending on the genre of music and emissions emitted during the 24-hour program. Not surprisingly, some of our mottos are: “To all the little”, “We are only for you”, “We are where you are and you”, “When you all leave, we remain with you etc.